Educating and formation of very poor children in Bolivia who live on the street, on garbage dumps, in prison and eradicating child labour in the mines of Potosi. Voix Libres was founded in 1993 in Geneva by Marianne Sébastien. This international humanitarian organization is apolitical and non-confessional. The organization tries to help children and families in Bolivia so that they get the opportunities to make a better life for themselves, by giving them the chance to get an education. Those in need are the people who live on the street, on garbage dumps or in prison. One of the most important aims is to eradicate child labour in mines. Voix Libres principally organises education for children and adults and grants micro credits. What does Voix Libres do? Education: Children and adults get the opportunity to go to school. 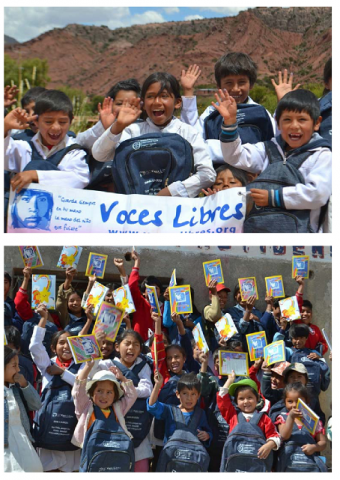 Voix Libres donates the necessary books and money. After they graduate many of these children take over the coordination of the projects of Voix Libres. Already this seems to be a success because these children know the problems these communities are confronted with and this way of working guarantees continuity. Micro credits: These micro credits are basically interest-free loans. This money is mainly used to get a degree or to start up a small business. After the loan is paid back, another needy person can benefit from it. Carpenters, workshops for jewellers, shoemakers, bakeries and construction companies are a few examples of small enterprises that have been set up with the help of these micro credits. Keeping children out of the mines of Potosi: One of the main aims of Voix Libres is to keep children out of the mines. These children are often very young when they start working in those mines. The organization tries to do something about the fact that children must work in the mines since decades: campaigns are run, money is provided so they can go to school. Food self-sufficiency: Agriculture is not easy in the mountains of the Andes, at an altitude of 3 000 meters. Warmth and water are scarce. A sufficient food supply is necessary to avoid a flee to the city and produce a reasonable income for the farmers. Health care and other infrastructures: Health is a priority. In Bolivia, there is still a high incidence of infant and maternal mortality. Doctors are working for the organization by offering basic health care and furthermore other infrastructures are procured for basic hygiene. Meeting centres, orphanages, workshops, ... are built. Their fathers will receive a training on autonomy and non-violence, have an access to micro-credits, medical care and a legal support. For 1.000 backpack filled with school material for girl students: 10.000€. Audit info : These figures result from the annual accounts which have been analysed by Fisco Zone sprl-bvba, accountants BIBF-IPCF 70042484. The available amounts on 31/12/2017 are 25.247 €. The available amounts are defined as the difference between the current assets and the sum of debts and provisions. The available amounts on 31/12/2016 are 18.421 €. The available amounts are defined as the difference between the current assets and the sum of debts and provisions. The available amounts on 31/12/2015 are 20.070 €. The available amounts are defined as the difference between the current assets and the sum of debts and provisions. The available amounts on 31/12/2014 are 9.552 €. The available amounts are defined as the difference between the current assets and the sum of debts and provisions. The available amounts on 31/12/2013 are 30.738 €. The available amounts are defined as the difference between the current assets and the sum of debts and provisions. The available amounts on 31/12/2012 are 27.464 €. The available amounts are defined as the difference between the current assets and the sum of debts and provisions. The available amounts on 31/12/2011 are 24.789 €. The available amounts are defined as the difference between the current assets and the sum of debts and provisions.